Effective January, 2016, Air-Tite put in place a new pricing policy ending discounts on coin capsule retail packs that allowed distributors such as Transline to sell capsules to dealers and resellers at a 40% discount. 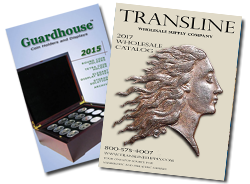 Transline will continue to stock Air-Tite retail packs, but effective February 23, 2016 the discount will change. We are currently exploring all options to continue to offer coin capsule retail packs to our customers at a full reseller discount. This price change affects ringed and direct-fit capsules in red card retail packs only. Bulk Air-Tite prices are unaffected, and did not change. Top seals shut and contents are secured by two black end caps. Perfect for shipping Silver Bars. Accomodates twenty 38, 39, 40 or 40.6mm coins. Coins fit vertically into slots. Top seals shut and contents are secured by two black end caps. Perfect for shipping rounds, large dollars and silver eagles. Holds a $20 gold coin, saint gaudens, double eagles.